I clicked on the rating because I hoped that I would recieve more information. Instead it rated the book which is skewing the average. I clicked in the middle which gave this book a 3.5 rating. I have never read the book and I am trying to figure out how to remove the rating, my apologies. Made with raw carrots per her headnote suggestion. Very good, nice change of pace for a carrot salad. Made with raw carrots, tripled the lemon juice by mistake, but still delicious! We are lemon lovers, though. Satisfying, healthy dish but very time consuming. From start to finish, it took nearly 90 minutes to clean, chop, slice, mince, and cook vegetables; cool vegetables, mix eggs and milk with vegetables and bake the pie. Served with small baguette, tapenade and crudités. Sauvignon Blanc went well with the pie. This would make a nice brunch dish or side dish too. I used both fresh mint and dill for the herbs. This made for a delicious addition to a tapas dinner for family. I mixed ingredients and rolled golf ball size meatballs a day ahead and popped them in the oven while making the stovetop dishes. We really liked the lamb and pine nut combination. Easy and quick! Served with tzatziki (from 100 Days of Real Food). Excellent and very easy. Used as salad dressing. Surprised that this didn't work well for us, given that her recipes almost always do. We found that the taste of scallions disappeared a bit, and the oil-cured olives (she didn't specify which kind of black olive, so we used these rather than something like kalamata) didn't go well. Delicious. This was easy to put together and the marinade topping added a lot of flavor interest to the halibut. This recipe has been on my to do list. Definitely will repeat... had to hunt down the harissa sauce and finally found it at Trader Joe’s. I ended up ordering the preserved lemons online. What an excellent recipe! However, It was a time-consuming and all hands-on-deck dish. I love pomegranates and this recipe met my expectation for enjoying a meat-based dish using that fruit. My eyebrow raising comes from two things: the recipe requires attention at the stove and oven for more than an hour. I started “making” the dish three hours before serving by putting the marinade together and basting the chicken, as well as making the basting sauce. Baking the actual dish took nearly twice as long as the stated time - 40 minutes,and four rounds of painting the chicken with sauce , instead of stated 25 minutes with three bastings. Even though time consuming, this is definitely worth the effort- a top notch recipe. Served the chicken, sauce, and fresh pomegranate seeds with steamed broccoli. Nice! Easy grilled chicken recipe. I only marinated it for about 30 minutes at room temperature and I got good flavor from the lemon (less so from the garlic with the shortened marinade time). This was good but we think it would have been better with a sauce such as tzaziki or another Mediterranean sauce. I did roast everything in my oven since it was 14 degrees outside and didn’t want to fire up the grill. I marinated the lamb for five hours; the herbs and spices gave the lamb a nice flavor. My husband and I also think the vegetables would have been better if marinated and skewered along with the lamb as is usually the case in recipes we use for kebabs. Will repeat with some tweaks. ...this book...goes beyond dieting to offer Americans a path towards nourishing, health-conscious (but not austere) cooking and eating. With a foreword by Marion Nestle. Spanning the Mediterranean from Spain to France, Italy, and Greece, with side trips to Lebanon, Cyprus, and North Africa, this revised and updated edition of Nancy Harmon Jenkins's acclaimed cookbook offers ninety-two mouthwatering new dishes plus the latest information about the nutritional benefits of one of the world's healthiest cuisines. But best of all are the recipes - bursting with flavor, easy to prepare, and sure to please everyone at your table, whether you're cooking for yourself, your family, or your friends. 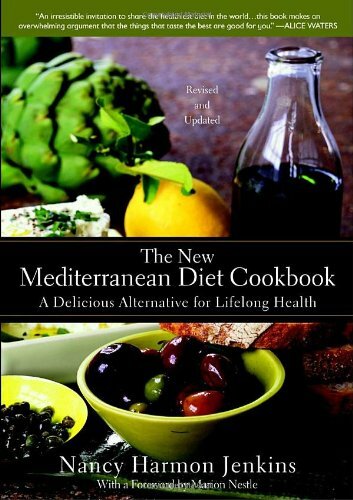 Known for classic favorites like tabbouleh and ratatouille, flatbreads, pastas, zesty herbs, and flavorful oils pressed from succulent olives, the Mediterranean diet combines delicious taste with health-supportive ingredients as few other cuisines do. With an emphasis on fruits and vegetables, grains and legumes, fish, lean meats, and heavenly desserts, here are recipes for over 250 outstanding dishes created for today's American kitchens. You'll also find new cooking techniques and a simplified approach to cooking - because simplicity is what the Mediterranean way of eating is all about. Experienced and novice cooks alike will be inspired by these delectable, seasonally inspired recipes ranging from sweet young Roman-style peas for spring to skewered shrimp for summer, robust North African Pumpkin Soup when autumn is in the air, and warming winter dishes like Lebanese Garlicky Roast Chicken and Cypriote Braised Pork with Wine, Cinnamon, and Coriander - plus a variety of fabulous pizzas and dinner pies, hearty salads like Tuscan panzanella, and satisfying small dishes known as tapas. Also included is a special selection of traditional dishes prepared for Islamic, Jewish, and Christian holidays that can be enjoyed year round. Rich in flavor and healthy nutrients but low in saturated fats and cholesterol, here are recipes that will delight your palate, nourish body and soul - and can be prepared with ease in your home kitchen.